Nina Nahmouli, M.A., FAAA, CCC-A. Home About Us | Nina Nahmouli, M.A., FAAA, CCC-A. Nina Nahmouli, is a licensed dispensing audiologist practicing in Los Angeles, California. She has certification in Audiology from the American Speech and Hearing Association and is a fellow of the American Academy of Audiology. She received her graduate degree in Communication Disorders from California State University at Northridge, California and prior to that she received her B.A. in English from the University of California at Los Angeles. 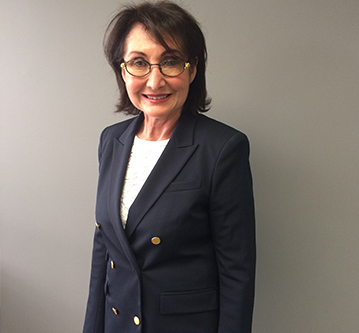 Nina has over 25 years experience in the field of audiology and hearing aid dispensing. The span of her career includes working in the Los Angeles County Hospital system, and several private-practice medical settings. During her career, Nina was a director of an audiology clinic, a mentor-lecturer to physicians and staff-audiologists in audiology practices, as well as a working audiologist providing diagnostic and rehabilitative services to patients ranging from birth to geriatric with diverse hearing disorders. Nina honed her skills in hearing care problem-solving and hearing aid fitting for adults and elderly patients with difficult to fit hearing losses over the span of her career. The patient who suffers from “tinnitus” (ear noise), or sensitivity to loud sounds, or reduced ability to correctly identify the proper sounds even while wearing a hearing instrument, or single-sided deafness are examples of difficult to fit hearing losses that Nina has successfully treated over the span of her career. Owing to Nina’s many years experience in diagnostic audiology she is poised to offer a comprehensive protocol and unique approach to helping you, the hearing aid consumer, make an educated, positive decision to enhance your life through the use of amplification. Whether you are a new user or an experienced user; whether you have had success or not with previous attempts to use amplification, Nina can help you!